Hibiscus shrubs are a spectacular addition to the garden as they provide vibrant colour for many months! The wonderful showy blooms of hibiscus (Hibiscus rosa-sinensis) make it a popular choice for gardens, especially in subtropical, frost-free areas where they flower continuously throughout the year. Gardeners in other parts of the country can also grow this is a popular shrub, as they do well in the Eastern and Western Cape, but should be protected from salt-laden winds. In inland gardens which experience moderate frost, protect your hibiscus by growing it next to a north- or north-west facing wall. In this sheltered environment, the sunshine and warmth absorbed by the wall will maintain a moderate air temperature around an established hibiscus. Hibiscus flowers come in many stunning colours, from pink, red, yellow, and orange to silvery white, and the blooms can be either single or double. Certain varieties of hibiscus have variegated foliage. 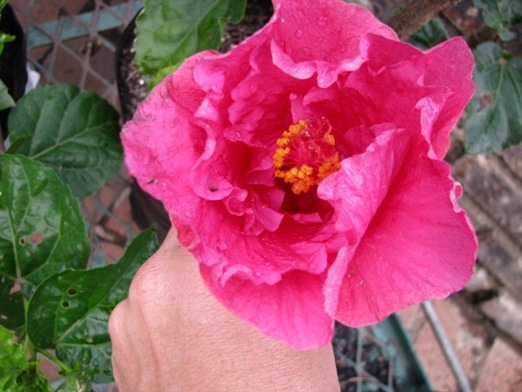 Plant hibiscus in a spot that receives at least eight hours of full sun a day. In subtropical areas they will also grow in a position which receives shade for half the day. If planted next to a wall, make sure you leave at least 1m of space between the shrub and the wall. 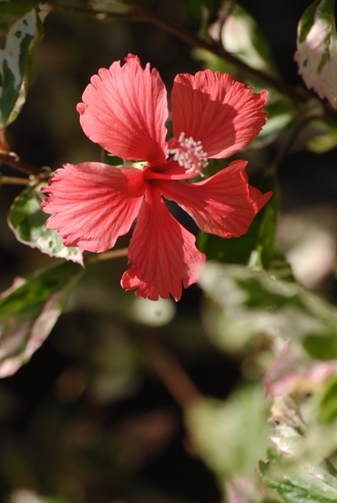 If you wish to plant a few hibiscus shrubs together, leave a gap of about 1,5m between them. Hibiscus also do well in containers on sunny patios or as standards along a path or driveway. Containers should be at least 70cm high and 50cm wide. When left unpruned, hibiscus eventually grow up to 5-6m high – making it a good hedging plant. 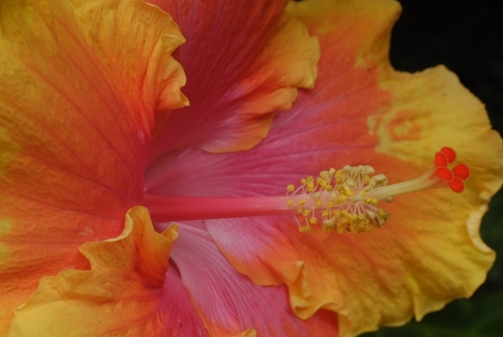 Hibiscus prefer rich, well-composted soil that drains well as they hate ‘wet feet’. ‘Lavender Chiffon’ – double, light purple flowers with red centres. ‘Bluebird’ – delicate lilac purple flowers. ‘White Chiffon’ – large, double, white flowers. ‘Jean de Arc – double, white flowers. South Africa has about 60 indigenous Hibiscus species, ranging from small ground cover herbs such as H. aethiopicus (fynbos) to trees reaching 5m tall. Kirstenbosch horticulturist Ernst van Jaarsveld says, “The flowers of indigenous hibiscus are typical of the species but are not the same size as the exotic cultivars. Nevertheless, they are floriferous and showy, coming in a wide range of colours – yellow, pink, red or often bicoloured.” The leaf size also varies and some indigenous hibiscus, such as Hibiscus irritans (found in the dry Karoo regions of the Northern Cape), have fine hairs which can cause skin irritations. The coastal hibiscus, Hibiscus tiliaceus, is a large shrub which is commonly found in the estuaries of KwaZulu-Natal. “It has round leaves and large yellow flowers which appear in spring and summer, changing to orange as they age. It is a fast-growing plant which grows easily in frost-free areas or where frost is not too severe. It requires a rich soil and plenty of water,” says Ernst. Hibiscus pendunculatus is a fast-growing shrub which reaches about 1m in height in its native habitat of the Eastern Cape to Mpumalanga. It bears striking pink flowers. It is easily propagated from seed and thrives well in gardens. Plant in a rich soil and water well. Hibiscus calyphyllus bears bright sunny-yellow flowers with deep red to black centres that close early in the evening. Attractive to butterflies and birds, this hibiscus looks great if planted 3-5 in a border. It also does well in containers. Provide shelter in cold, frosty gardens. ‘Agnes Gault’ – large, rosy pink flowers with a crepe paper texture. The slightly ruffled petals become a vibrant red or red-pink at their bases. ‘Brilliant’ – bright red single, medium-sized flowers. Popular as a hedge hibiscus. ‘Full Moon’ – large single to double yellow flowers with a white eye. ‘Gwen Mary’ – large watermelon-pink flowers. ‘Kinchen Yellow’ – large, single yellow flowers with a white throat. ‘Kona’ – medium sized, double pink flowers. ‘Midnight Mood’ – large, orange to yellow blooms with a maroon centre. ‘The Path’- large, single yellow flowers with orange to yellow edges and a pink throat.